Using our Competition fabric, this will provide a lightweight reliable shelter. The simple light structure of a tarp is great for buliding different types of shelter systems in the backcountry. 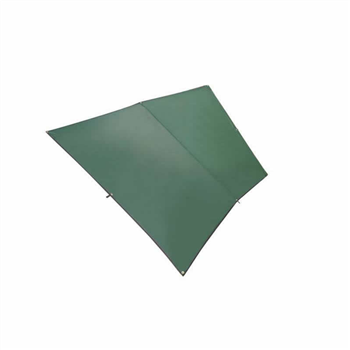 This Tarp is offered in 2 sizes, with this being the larger one and features reinforced eyelets, webbing tapes for multiple set up options, uses our high quality silicon nylon Competition fabric and is a lighter option to the Adventure Tarp. This tarp works great with our Discovery Lite bivi to offer a lightweight, reliable shelter system. This item is very flexible and can be folded into various different sizes and ways making it adaptable to fit different sized bags and paniers.